How to deal with dread. We are sometimes taught at a young age to be afraid; life is something to be feared. The truth is: “Fear” isn’t such a bad word or feeling. I choose to think of fear as a motivator to live my best life. Should I really be afraid? Is it a fear of failure? Success? How can I take the fear I’m feeling and use it to motivate me? We feel fear when something is outside of our control. But if you look back at all the situations in your life that caused you fear, you will realize that most of those situations were really what you needed. A fearful event may have allowed you to make a change that helped you live a better life, or it allowed you to accept what you couldn’t change and gave you the power to let go. Without fear, you would be stagnate. What is supposed to happen here? Of what am I not aware? Then thank your fear for leading you in the right direction. After you do this a few times, you will see fear as a teacher. I have had clients look back on past fearful events and realize that they led them down a better path. Maybe they went through a divorce that eventually resulted in finding a soul mate, or perhaps they were fired from a job and gained the freedom to start a business. Some clients experienced illness, forcing the realization that life is to be enjoyed now. Others let go of old friendships only to make room for new ones that brought even greater joy. Bad situations are wake-up calls. Recognize that you may have been ignoring your true self and your needs. Use this time to re-evaluate the circumstances and make new choices. Realize you’re not alone. Most people live with the same fear patterns. Perhaps we are taught to be fearful as we watch our friends and family members be fearful, and we observe it in the news. By knowing you’re not alone, and that everyone feels just as vulnerable as you do at some point, you’ll become empathetic. After we feel empathetic towards others, we can start to find self-compassion for ourselves. Accept your fear. Don’t deny your fear or try to hide it. Face it, accept it, and move on. 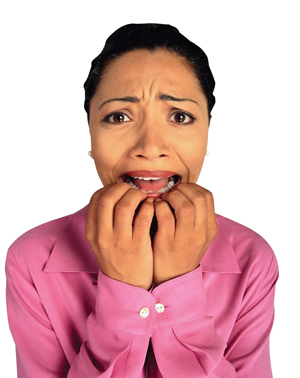 When we can truly admit to ourselves that we are fearful, then we can work past it. Just awakening to the realization that are experiencing fear starts the process of change. If we truly accept our fear, we don’t have to mask it with food, drugs, shopping, etc. Know how your body reacts to fear and stress. Do you get headaches, stomachaches, or neck pain? When we can sense the physical symptoms, we can use them as red flags, warnings to stop and ask the important question: Of what am I afraid? Slow down, be still, and listen for the answer to your fearful situation. This may come in the form of intuition, a dream, a vision, or just a random thought. Be open to the possibilities. If you don’t use fear as a guide to make the right changes, another crisis may be just around the corner. The choice is yours. It’s up to you to decide how you live your life. Fear can be a blessing. About the author Diane Lang, M.A. Diane Lang, M.A., is a therapist, educator, and author. For more information, visit her at www.dlcounseling.com, or e-mail her at lifeline36@aol.com.